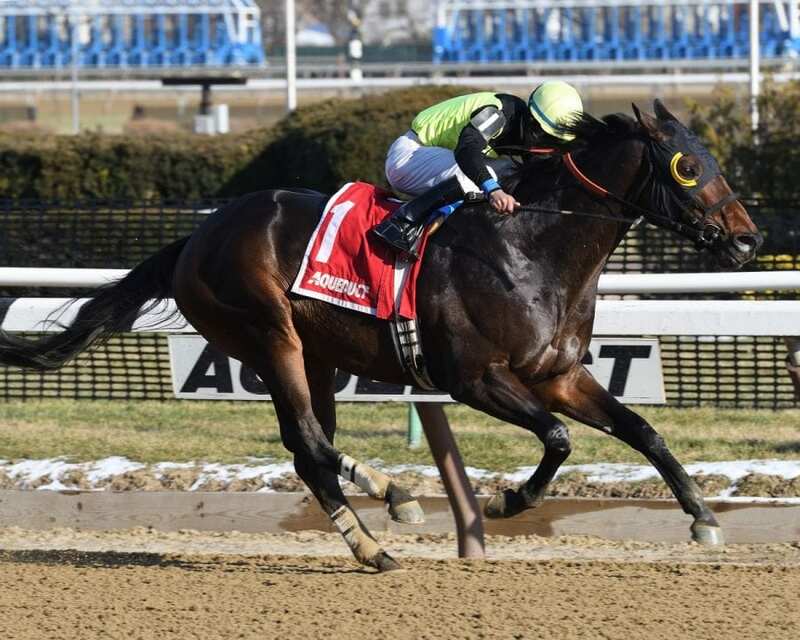 Multiple graded-stakes winner Green Gratto will look to earn a return trip to the winner’s circle for the first time in almost a year as part of a field of 10 4-year-olds and up in Saturday’s Grade 3, $200,000 Tom Fool Handicap at Aqueduct Racetrack. Carded as Race 9 as one of four stakes- and one of two graded stakes, along with the Grade 3, $300,000 Gotham that is part of the Kentucky Derby Championship Series worth 50 points to the winner – the Tom Fool will feature Green Gratto looking for his first win since he captured the Grade 1 Carter Handicap at odds of 54-1 in April 2017. The veteran 8-year-old will be making his 63rd career start and posted his eighth career win at the Tom Fool distance of six furlongs. The Here’s Zealous horse was bred in New Jersey by Kaz Hill Farm. Green Gratto, who also won the 2017 Grade 3 Toboggan and the 2015 Grade 3 Fall Highweight Handicap, was part of the pace scenario in his last three starts before finishing out of the money, including sixth in the latest edition of the Fall Highweight on November 23 at Aqueduct before running fifth in the Gravesend and sixth in the in the Grade 3 Toboggan on January 27 last out. Grant said Green Gratto, who will carry 116 pounds while breaking from the rail with Andre Worrie aboard, will continue to be a pacesetter. Cheyenne Stables’ Classy Class will return to stakes competition after back-to-back runner-up effort in allowance optional claimers at Aqueduct. The 6-year-old Discreetly Mine gelding has finished in the money in five of his last seven starts, including the Grade 3 Salvator Mile with a 2 ¾-length score on June 17 at Monmouth Park for trainer Kiaran McLaughlin. Classy Class will be cutting back in distance after four straight starts of at least one mile. Classy Class carry 117 pounds with Joseph Rocco, Jr. in the irons from post 2. Bruce Golden Racing’s Great Stuff is coming off his first career graded stakes win in the Toboggan, earning a personal-best 102 Beyer Speed Figure for his 2 ½-length win over Vulcan’s Forge. Great Stuff, who has been training at Belmont Park, has two wins and a second-place finish in five career starts on Aqueduct’s main track for trainer David Jacobson. The 6-year-old son of Quality Road will see Dylan Davis with the return call from post 3 carrying 118 pounds. Life in Shambles, who has finished on the board in seven of his last nine starts, has posted Beyers in excess of 90 in four consecutive races, including a runner-up effort to Do Share in the Gravesend on December 23 at the Big A. Trained by Hall of Famer Steve Asmussen, Life in Shambles will be cutting back in distance after running fourth in the seven-furlong Toboggan in January. The 7-year-old son of Broken Vow will carry 113 pounds with Rafael Hernandez aboard from post 7. Favorite Tale will run at a New York track for the first time since his third-place finish in the 2015 Grade 1 Alfred G. Vanderbilt Handicap at Saratoga Race Course. Trained by Guadalupe Preciado, the 7-year-old Tale of the Cat gelding started his 2018 campaign by winning the Dave’s Friend on January 8 at Laurel Park before running fourth in the Fire Plug at the same track on January 20. Favorite Tale will have the services of jockey Kendrick Carmouche, carrying 119 pounds, from post 9. Rounding out the field is Threefiveindia, for trainer Chad Brown, carrying 115 pounds in breaking from post 4; Candid Desire, carrying 113 pounds from post 8 for trainer Gary Sciacca; Spartiatis, for trainer Rudy Rodriguez, carrying 115 pounds in leaving from the outside; Skylar’s Scramjet, for trainer Michelle Nevin, exiting post 5 carrying 115 pounds; and Do Share, for trainer Linda Rice, drew post 6 as the 120-pound highweight.